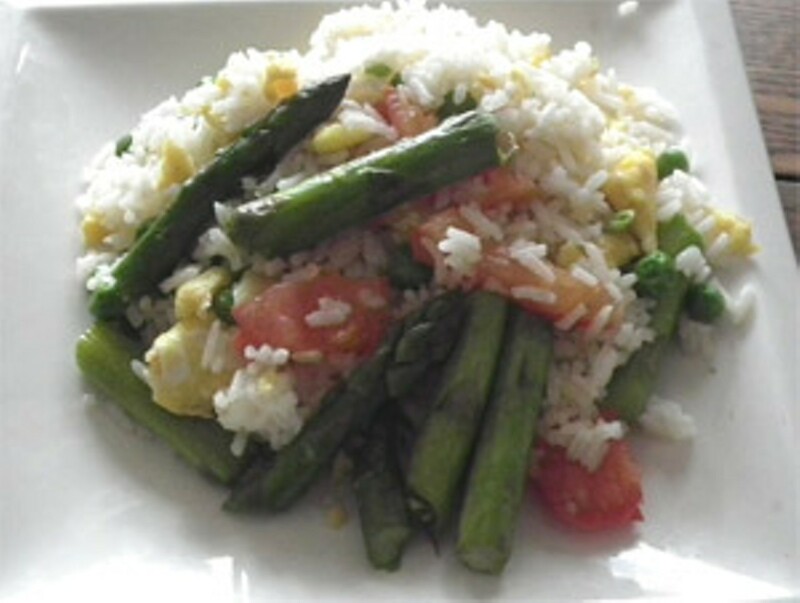 Spring Vegetable Fried Rice | Home Cookin' | Kids VT - small people, big ideas! Fried rice has got to be one of the world's perfect foods for parents. On the cooking end, it makes few demands: It's simple to put together, requires items that you usually have around, and makes great use of leftovers. Once it gets to your table, its ingredients are clearly visible to any suspicious picky eaters in your family; and the mildly flavored, one-dish meal offers multiple food groups. My version features asparagus, but feel free to substitute any vegetables you have in the freezer or crisper. For great results, keep the vegetables — and all of the ingredients — dry before mixing them with the rice. Sautéing veggies first will keep the finished product from being gloppy. My darling boys, 5 and 8 years old, were eager to help make this dish but looked mistrustfully at the cooked asparagus. Once I mentioned that it would make their pee green and stinky, the 8-year-old started gobbling it up at a startling rate. His brother lobbied for gooey cheese sauce, but he was out of luck. Surely you will not have to go to such lengths with your own little diners. 1. Heat 3 tablespoons of oil in a large skillet until hot. Add the eggs and cook over medium heat until set, then stir with chopsticks or a wooden spoon to break into tiny pieces. Continue to stir and cook until eggs are lightly browned. Remove to a plate and set aside. 2. Heat the remaining oil in the same large skillet. If using garlic or ginger, add them here and cook for 3-4 minutes over medium heat, until you can smell them. Then add the asparagus and any other fresh vegetables (hold the peas for the next step) and cook until the color brightens, about 3 minutes, stirring frequently. Sprinkle very lightly with salt. 3. Add the peas, eggs, any other protein and frozen vegetables, rice, and salt. Stir well to break up any lumps and make sure all ingredients are mixed well. Stir in basil or sesame seeds, if using, and serve.